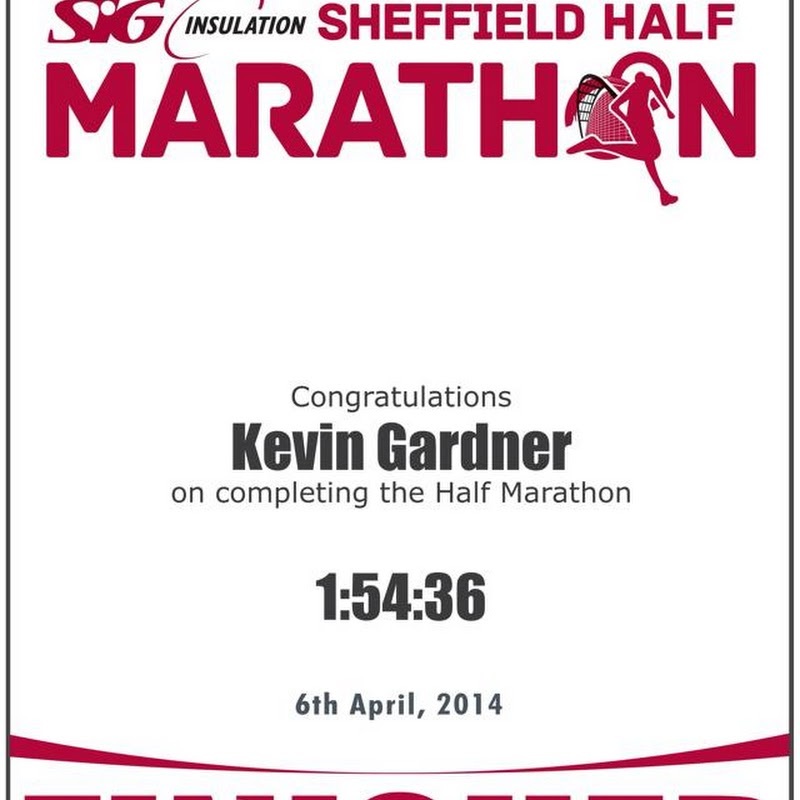 On Sunday April 6th I was entered into the 33rd annual Sheffield Half Marathon. It turned out to be one of the weirdest days of my life. I didn’t realise it was weird until quite late in the day, but apparently it was all quite weird. You may have heard that the race was cancelled due to lack of water on the course. You may have seen streams of abuse flying in all directions in the aftermath. 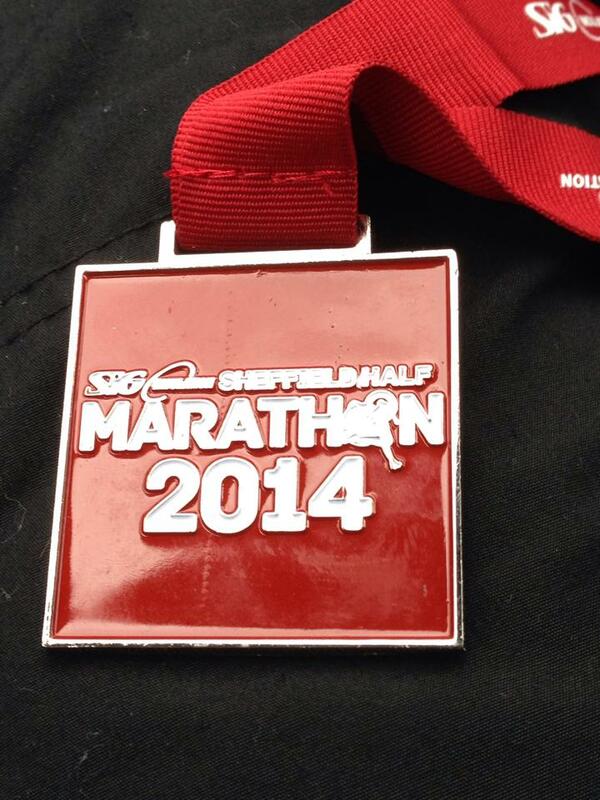 You may have seen that 4100 people ran the course and finished, and got their medals and t-shirts. Funny, all that. Somehow my day didn’t seem quite so extreme or interesting until the media (and by that I mean the social media as well as the “big” media) started telling me about it. So to set the record straight, at least in my own head if nowhere else, here’s a quick summary of my day, and a few of my feelings about some of the stuff I’ve been reading since. The day started bright and early at 5.15am at my parents house in Leicestershire. It should only be about 90 minutes to the event from there, so we had plenty of time for me to get fuelled up and for Kas and Ami to get dressed to come support me. It was here I noticed my first peculiarity of the day. When I came to put on my running shoes I noticed I had my old pair not my new ones. This might not seem a big thing, but I changed them because the old ones were starting to get a bit solid under the heels and weren’t doing my ankles any good. So old trainers it is, then. The daft thing is that I didn’t notice when I packed bags away back on Wednesday (as I was on a business trip before the weekend). 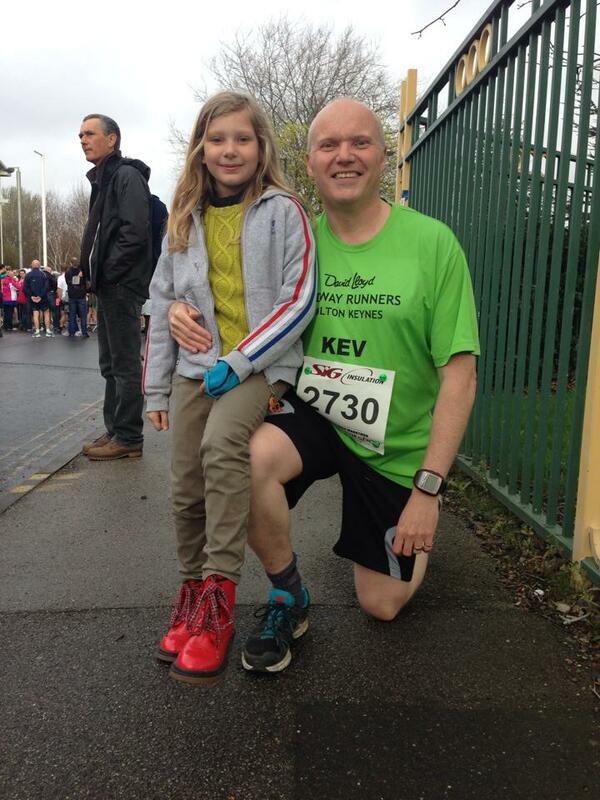 And I also didn’t notice when I ran parkrun at Conkers on Saturday morning – I just put on the shoes in the bag. And now, when I’m getting myself psyched up for a race, I notice I have the wrong shoes. The drive up took the quoted 90 minutes, and after a brief flirtation with being guided into a car park that was unnecessarily far from the race venue, and then moving the car to somewhere in the same timezone at least, we piled out of the car, decided which bags Kas was going to carry and what was staying in the car, and off we set for some breakfast for the girls and a coffee for me. So far so good. The Don Valley Bowl seemed a decent enough venue and was surrounded by other buildings that were being used to support the event, including the Ice Sheffield building, which was quoted as being “open for runners to use toilets and changing facilities and use of the cafe/concession stands” – Hmmm ! The cafe actually wasn’t opening until 8:30, which is bog all use when the race starts at 9. Still, there was plenty of space to change and the added spectacle of some people practising some figure skating out on one of the two rinks. So far so good, still. We plumped for breakfast (plump being a very appropriate word) at a little tut-tut machine out in the bowl that was serving nice coffees with a selection of sweet items that were too small to be called cakes but too big and complicated to be mere biscuits. Ami had three of those and a hot chocolate. I had coffee, as did Kas. After which time was moving on so we went back into Ice Sheffield for a quick change act and the usual pre-race turning my bike round, if you know what I mean. In a bizarre reversal of normal fortune there was a big queue at the gents and none at the ladies. I guess running clothes tend not to have zips on the front, which makes bog all difference to the girls but makes a big difference to blokes. Got the job done and got outside in good time to go to the start area though. Still all going well. I found a convenient fence to lean on whilst doing my stretches – Ami joined in for this part – and then Kas did a nice snappy-snap of me with Ami. After this I decided it was time I went to the starting area and started thinking about my race plan. This was the point at which it all started going a bit pear-shaped. First of all came one of the organisers walking down the pen announcing there was going to be a half hour delay because of “an incident on the course that the police needed to attend to” I thought “Fair enough, probably a car crash just before they had to close a road off, or something, I hope no one’s hurt”. Kas left me in the pen at about 9:10 to go find somewhere to stand on the course so she and Ami could wave at me as I went past. As I rounded the corner to the actual start line there was the slightly disturbing sight of the lead car parked up on the start line with the official race clock stuck on zero. Something’s going wrong then…… But all the runners were just going past it. I found Ami and Kas about 500 yards in and I think I shouted to them that I had no idea whether we were actually racing or not, but everyone seemed to be just going for it. And from that point right up until I came back into the Don Valley Bowl at the end you would never have known that there was an issue. What do I mean by that ? Well you may have seen some horror stories about no water, and loads of people collapsing by the side of the road with dehydration, and police blockades, and public spirited people buying water from the nearest newsagent and handing it out and plucky locals making a fantastic day out of a total debacle, but to be honest, from a very personal point of view, I didn’t see any of that. I saw 4100 or so people running a race. My experience of the run was undoubtedly improved by the fact that I didn’t realise I was supposed to be dying of dehydration. In truth, I really enjoyed the running. I tend not to drink much on a half anyway unless it’s hot. My first and only drink was three mouthfuls out of a plastic cup at about 8 miles, I think. By this stage I’d passed a number of water stations, all of which seemed to have water. The course was, in any case, lavished with rather more water stations than most half marathons I’ve run – at least 6. Personally I had no clue that the reason for the delay was a lack of water. Sure, I got passed by 4-5 people at 6 miles who offered me a swig of their water before passing it on to someone else, but even then it didn’t occur to me that there was a water shortage and at no point was water an issue for me. When we were running out and back along Eccleshall Road there was some drizzle in the air. It was quite cool and really quite comfortable to run in. Also, there were quite a few people out supporting, and at several points I strayed to the side of the course to engage in a few high-fives. I always like to do this, especially with kids, because I know my kids love it when they hold out a hand and someone high-fives it for them. And anyway, it’s sort of a runner’s way of thanking the crowd, that and personally thanking as many of the marshals as I can manage. It costs me little and I hope it’s what makes them volunteer, or come out to support, in the first place. The race was quite uneventful for me. I was slightly ahead of my planned speed most of the way (1.55 with absolutely no walking) and before long I found myself running back up towards the last mile thinking I was doing rather well. I bombed a bit in the last mile as I started getting tired and I lost a minute or so there, but I still finished in a very pleasing 1:54.39 on my watch, so right on plan. 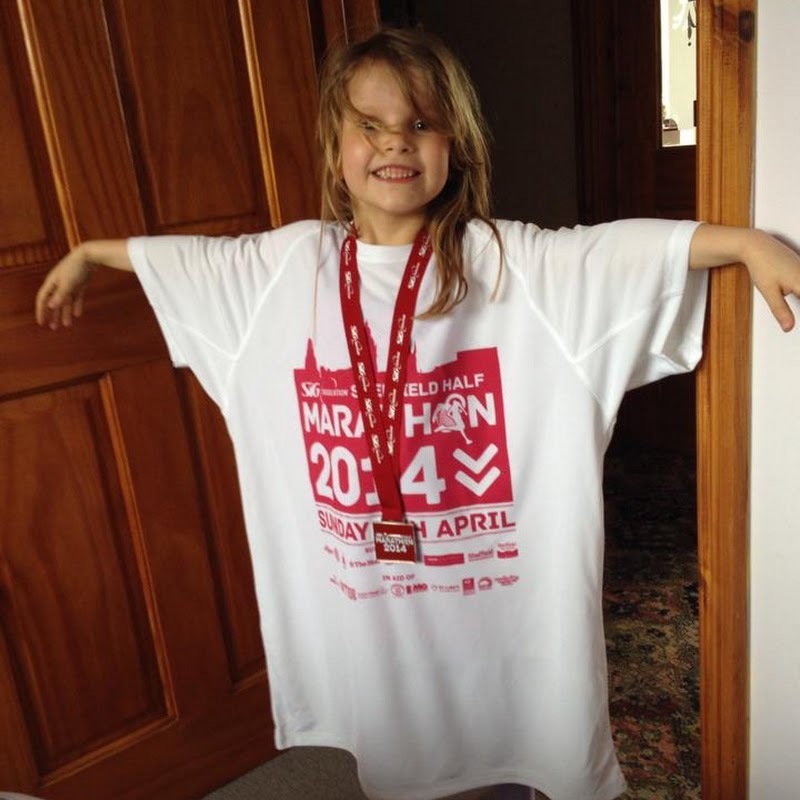 I went through the finish line, and I got my t-shirt and a goody-bag with my medal in it, and I then wandered over towards Ice Sheffield to look for the girls. And when I met them we had an ice cream and a drink from an Ice Cream Van while Kas told me all about the near death experience I’d apparently just been through. We had to dash between streams of returning runners to get back to the car, and then we jumped in and made out way home. I left the arena thinking it had been a decent race, and a decent course, and overall quite a good day, even with the delay. It was only when I got back to my folks’ house and started watching the news and reading the twitter and facebook stories that the full horror of the blood-letting fest hit me. Let’s just say that whilst there were evidently some problems, and apparently some of the competitors did not get to run, for me the experience was OK. So here’s a few of my retorts to some of the bits of feedback that I’ve seen in the press and on social media that I regard as overboard or plain rubbish. There were lots of comments about the price being exorbitant and for that money you would expect that you’d get water. Well, to be honest, the price wasn’t exorbitant. It was £26 (£24 if you’re an England Athletics club member, which I am). That’s less than half the cost of the Great North Run. It is one of the few large events in the UK that is run by a not-for-profit organisation and which gives all of its proceeds to charity. From that alone you can assume that the majority of the fees for venues, policing, medals, medics, and the like are perhaps being paid for by the corporate sponsors and that the entrance fee is a charity donation. So cut them a bit of slack, huh ! They made a big mistake, yes. They tried to recover but couldn’t, and then in a fairly chaotic situation they had to make a decision. They elected to cancel the race, which is not a happy decision for the runners, but after an hour of people standing around they’ve got to make a decision and they decided to err on the side of safety, thereby making themselves look like incompetent idiots and precipitating the downfall of their own event. Not an easy decision to make. I understand that they did manage to get a barrier across the start which prevented a lot of the runners at the back of the pen from starting their run. In hindsight this was probably a good thing. Runners at the back of the field are more likely to need the water and less likely to get it. So thirdly, there was a video clip on the BBC website of an interview with a woman who finished in 1.56 who said she thought she’d seen “more people collapsed at the side of the road than normal”. This seemed bizarre to me. I ran at 1:54 pace, so I was a minute or two in front of her. I saw one guy on the floor about half a mile from the end (I wish him well and I hope he’s OK), but I didn’t see whole droves of people on the floor. And even if I had, then given that every water station had water when I passed it, this couldn’t have been caused by a lack of water on the course. So I sincerely feel very sad for anyone who did have a problem and I wish them a speedy recovery, but it’s important not to throw idle speculation to fuel the fire or sensationalise a story. I’m not sure you could immediately assign water shortage on the course as the reason, and I would be very interested to see whether there was a greater proportion than normal of participants in the sub 2 hour category who collapsed. Bear in mind there are always some, and there always will be some, because in the words of the immortal bard, sh*t happens. I didn’t see clear evidence that water shortage on course was causing loads of people to suffer, and given that it was about 10-12 degrees, cloudy and a bit drizzly I’d be surprised if dehydration was the single reason for any of them. I’m sorry, but someone who’s trained properly to run a half marathon in under 2 hours is very unlikely to collapse with severe dehydration unless something else is wrong too. So there’s a load of people baying for blood and demanding they get a refund on their entrance fee. Refund ? Why ? What good will it do ? If they offer a refund to me it’s going to a charity. If I’m feeling ironic I’ll give it to a charity that provides clean safe drinking water to people in developing countries. Sure, if you were prevented from running your race then fair enough, you should be offered a full refund or a free place for next year. But if you got your medal and your charity got its donation, then was it really so bad ? 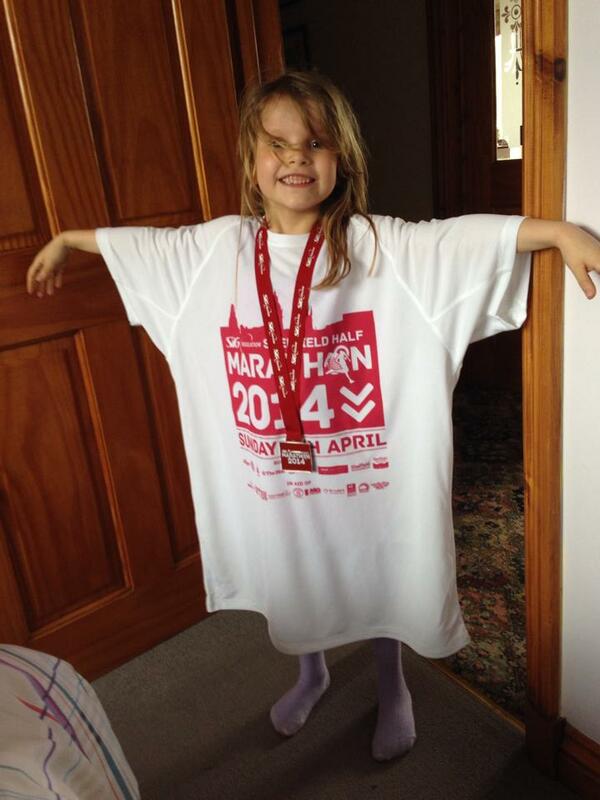 How much outrage were you really feeling as you walked back to your car with your t-shirt and medal ? And finally, this one is worth a mention if only because it brightened up my outlook while I was reading through the blood-letting session last night. I guess it’s on the general theme of “don’t spout your opinions about something unless you were actually there” but this one was so pathetically funny I nearly wept. Kas made a post on a website about taking some positivity from the event, and how the people of Sheffield got out and helped to make it a tolerable day for the majority or runners. One of the responders to her comment basically disputed this by describing it as a desolate course and a desolate place that he’d never come back to. He didn’t even run it this year, he ran it last year. So what’s the funny part ? “Desolate” is the funny part. I was reminded of a sketch from Fawlty Towers. 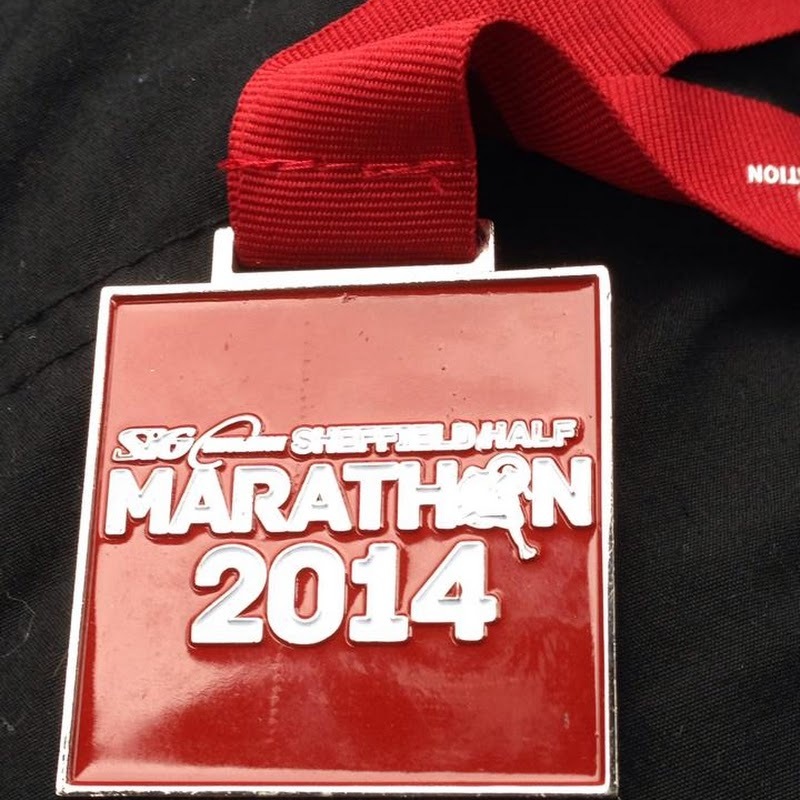 “What was sir expecting to see on a half marathon in Sheffield ? The Hanging Gardens of Babylon perhaps ? Herds of wildebeest sweeping majestically across the plain ?” – “I expect to be able to see Sheffield” – “You CAN see Sheffield sir, it’s over there in between the rain clouds and the tarmac” Pardon my French, but if you wanted to run a half marathon in beautiful countryside whilst listening to the gentle sounds of farm animals and birdsong then why did you enter a half marathon in Sheffield, ffs ? And what has any of that go to do with the lack of water anyway ? And finally finally, and you can absolutely trust me on this one, I’ve been to some pretty dull, characterless, ugly, soul-destroying places in my time and Sheffield isn’t even on the front page of that particular list. 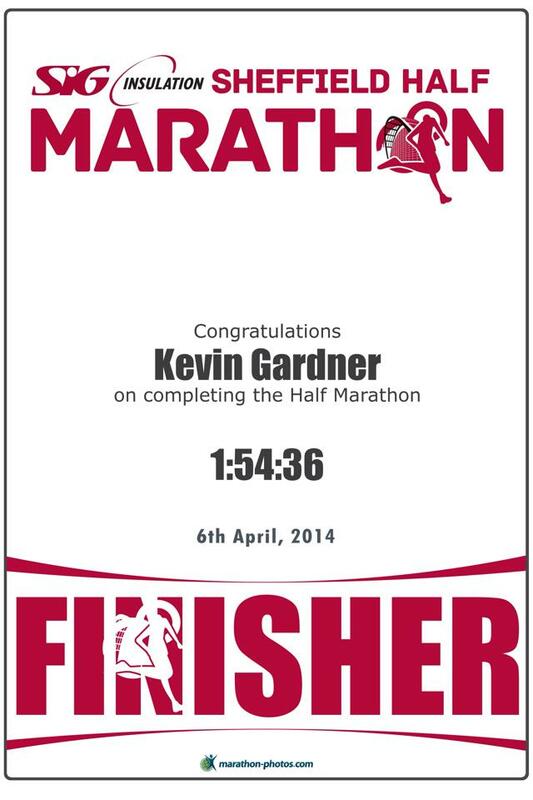 And yes, I’d run it again in another year. I enjoyed it.